The itinerant exhibition which the Canton devised for foreign countries can now also be seen in the St.Gallen Textile Museum. The St.Gallen population may be particularly interested in gaining an insight into the modern creative work done by today's textile industry. Like only a few places in the world, the St.Gallen region has been moulded by the textile culture. For a thousand years, high-quality fabrics have been manufactured here which are greatly sought-after goods and have exerted an influence on the development of clothing and furnishing again and again. Innovative St.Gallen companies continue to set standards in fashion design and in the development of sophisticated textiles for technology, medicine and sports. This unique tradition of craft and culture is the subject of this exhibition, which has been commissioned by the Canton of St.Gallen. Alinghi sails, and the latest lace bras. 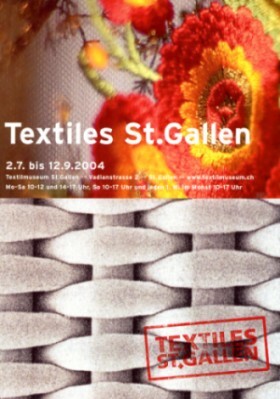 The historical part has been integrated in the permanent exhibition of the Textile Museum, "St.Gallen Embroidery". Flax cultivation as early as 3750 B.C. This part of the exhibition leads visitors as far back as the year 3750 B.C. Even at that time, flax was cultivated and woven in the area around Lake Constance, as several flax fabrics discovered in Pfyn near Frauenfeld testify. Cloths made of flax and wool have been evidenced in St.Gallen documents since the 9th century. Thus a man called Gozbert, who made over his possessions to the Abbey of St.Gallen in 816, received compensation which included, among other things, the textiles necessary for life on a yearly basis: a woollen garment, two linen garments, six pairs of footwear, a pair of gloves, one hat, bedlinen and, every two years, a woollen blanket. The rise of linen production and trade in St.Gallen can be traced back to the 12th century. It is estimated that as early as the second half of the 14th century, St.Gallen's linen production is was 2,000-3,000 cloths per annum, which is tantamount to an overall length of 200-300 kilometres. From the 16th to the early 17th centuries, the Eastern Swiss linen trade was Switzerland's most important export business. St.Gallen linen was sold as far afield as Germany, Spain, France, Italy, Austria, Hungary, Bohemia and Poland. Through the Mediterranean ports, it also reached the Maghreb, Syria, Persia, Greece, Turkey, the Crimea and even the Ukraine. In the 18th century, cotton weaving began to supersede linen weaving. Within only a few years, the linen stronghold of St.Gallen turned to cotton processing with spinning, weaving, printing and hand-embroidering. This was of crucial importance for the future of the region. The impulse for hand-embroidering is thought to have come from Turkish embroideresses whom St.Gallen merchants had noticed in Lyons. The base for embroidery was muslin. Embroidery quickly captured the city and its environs, and finally spread to large areas of Eastern Switzerland and the Austrian Vorarlberg. Thanks to cotton processing, Eastern Switzerland became an internationally competitive and progressive producer from 1730 to 1780. The Industrial Revolution was characterised by mechanisation, increases in factory size, and the growing significance of capital. This development made it possible for productivity to be increased many times over, with correspondingly lower prices. In St. Gallen, the Industrial Revolution coincided with the radical political changes in the wake of the French Revolution of 1789. With Napoleon's Mediation Act of 1803, which provided the basis for modern Switzerland and, along with it, the Canton of St.Gallen, the country regained its internal political peace and stability. From 1800 to 1820, the textile region of St.Gallen was introduced to industrialisation in the shape of the mechanisation of cotton spinning, weaving, textile finishing and embroidery. Owing to mechanisation, the production of embroidery took on completely new forms and dimensions. Within a short period of time, machines and other technical innovations made St.Gallen into the world leader in the field of embroidery. In the 19th century, the city became an affluent metropolis. About 100,000 people earned their living directly or indirectly in the textile industry. The First World War and fashion's concurrent turning away from embroidery brought fundamental change. The number of people employed in embroidery dropped from about 70,000 in 1910 to 6,000 in the mid-1930s. Recovery only set in after 1945. Eastern Switzerland's textile monoculture changed in the direction of economic diversity. The textile economy became one economic branch among others. New synthetic fabrics on a mineral oil basis played an increasingly important role. With innovative niche products of high quality, the textile Industry succeeding in attaining the position of a global leader. To this day, the high quality of St.Gallen embroideries has ensured that they remain the materials that are in greatest demand for creations designed for the catwalks of Parisian haute couture. Technical textiles such as fabrics for filters, serigraphy and textile printing, or for the development of a new type of bandage, have increased in significance. Despite innovations and an increase in productivity, the number of employees has dropped. As early as the 1960s, various firms began to move their production plants abroad in order to cut labour costs. Even so, 40 years later virtually all the sectors of textile production are still represented in the textile region of St.Gallen.